I expected the launch of Falcon 9 by SpaceX, the privately owned space travel company started by PayPal and Tesla Motors cofounder Elon Musk, to be anticlimactic, a brief firework that shot off with a pop. But half the excitement of watching a rocket launch is the fear it might blow up. A January 6 attempt was halted at the actual last minute when a launch team member observed a problem with the second-stage thrust engine’s vector control system. On Saturday, SpaceX tried again. As I watched, any pretensions I had of being jaded about space travel were obliterated. The live stream on the company website was fairly steady, although it glitched a few times, which felt a little foreboding, because you do not want to glitch in space. The rocket began to fire and then slowly go up, blazing against the black sky. The feed turned into a split screen, showing both the rocket launching and a view from inside the first stage, where fuel beads were floating in microgravity. This portion looked like the “Star Gate” sequence from 2001: A Space Odyssey, entering that realm of the psychedelic spiritual that 2001 broke into, and that all ambitious sci-fi films have aimed for since. There is potential for chaos in even the most well-planned rocketry. The national Space Age dream ended in 1986, when the Challenger tragedy was broadcast live to a horrified audience. But it didn’t disappear. It once again became the dream of eccentrics and of rich men. SpaceX has a $1.6 billion contract with NASA to supply the International Space Station, and Musk has cut a figure in the last decade as a millennial version of Richard Branson — an idiosyncratic billionaire with an interest in commercialized aerospace travel. When you hear his accomplishments rattled off — the series of innovations that changed industries — the dapper, intelligent, incredibly rich Musk sounds like either Bruce Wayne or a Bond villain. Musk seems too good to be true, but he’s not a huckster. His track record with SpaceX is increasingly impressive, and his motives are seemingly on the level. Most importantly, his science is tight. Musk is deadly serious about streamlining the space program, albeit from a privatized perch. His driving interest benefits everyone in the space business, even if it means they’ll have to buy from Musk (for now). But after Musk made the patents for Tesla cars open-source, it’s not too hard to imagine him allowing something similar for SpaceX’s innovations. Falcon 9 (actually Falcon 9 v1.1) is on a mission to deliver 5,000 pounds of supplies to the International Space Station, on a contract from NASA, via a cargo spacecraft called a Dragon capsule. Falcon 9’s other objective was to land the first stage of the rocket on a drone ship — not a spaceship, but a floating platform east of Jacksonville — so that it could be used again. SpaceX’s plans for reusable rocket parts hit a snag when the first stage of the rocket made a “hard” landing. Musk tweeted, “Rocket made it to drone spaceport ship, but landed hard. Close, but no cigar this time. Bodes well for the future tho.” “Close, but no cigar” is not necessarily what you want to hear from the pilot on your flight to Mars, but endless testing with sometimes unpredictable results is how rocket science works. Molly Lambert Jet Propulsion Laboratory at night. The history of rockets often reads like science fiction — which maybe makes sense, since rocket scientists are often inspired by science fiction. The history of rockets is dotted with mad scientists, chemical engineers in the basement mixing up the medicine and running tests in barns and fields — especially in California. Falcon 9 launched from Cape Canaveral, Florida, on January 10 at 4:47 a.m. ET, but a few of the SpaceX launches planned for 2015 will occur near Lompoc, California, at the Vandenberg Air Force Base. The base is a couple of hours up the coast from the Jet Propulsion Laboratory, the research center and NASA field site cofounded by John Whiteside Parsons, better known as Jack Parsons, who was a rocket scientist and Thelemite occultist. Parsons was raised in the wealthy suburb of Pasadena and took a shine to science fiction as a kid. His interest in explosives also started early. He launched model rockets as a child and worked a teenage summer job at Hercules Powder Company, a chemical manufacturing plant. He was forced to abandon plans to attend Caltech during the Great Depression, but he applied for independent funding from the school, with which he was able to join the first (and, at the time, only) university-funded rocketry program, the Guggenheim Aeronautical Laboratory at the California Institute of Technology. As a member of GALCIT, Parsons tested rocket motor prototypes. The experiments were dangerous and they sometimes misfired spectacularly, which led Parsons and his cohorts to be dubbed “The Suicide Squad.” But the successes drove them on. Parsons was in the right place at the exact right time to be drafted into the burgeoning space industry of the ’30s, which was being invented on the spot. He was already attracting a following as a speaker and thinker. He testified as an expert witness on explosives at a high-profile trial that indicted Los Angeles police captain Earl Kynette for killing a private investigator with a bomb. Parsons also appeared as a guest speaker at the Los Angeles Science Fiction League, which brags of being the world’s “oldest continuously-active science-fiction and fantasy club.” The government, in a first, paid Parsons and his associates to develop new technologies like rocket propulsion for military aircrafts, known as JATO (jet-assisted takeoff). After blowing up a few too many things on the campus of Caltech, his team began a facility (sheds, at first) in the dry riverbed called Arroyo Seco, located in the small city of La Cañada Flintridge just outside L.A. The company was called Aerojet, and with a $3 million grant from the U.S. government in 1943, it became the Jet Propulsion Laboratory. The group of metal sheds became an increasingly elaborate and professional facility. In 1958, JPL was integrated into the brand-new National Aeronautics and Space Administration, at the golden dawn of the American Space Age. One of Parsons’s closest friends was L. Ron Hubbard, who took some of OTO’s esoteric principles with him when he went on to found Scientology. Parsons and Hubbard conducted a magick ceremony in the Mojave Desert called Babalon Working, a secret ritual involving bloodletting and incantation while Prokofiev and Rachmaninoff records were played for hours. The intention was to bring a goddess named Babalon into the earthly realm as a partner for Parsons.2 Parsons believed that magick and quantum physics were intertwined, two ineffable forces of the universe that controlled the mysticism of the known world and contained the secrets of the as-yet-unseen corners of the universe. Furthermore, he didn’t see any kind of disconnect between the hard science of rocketry and the esotericism of Thelema. Astral projection seemed no less ridiculous than the idea of literally traveling through the stars. And he wasn’t as far out as it might seem. California bohemians of Parsons’s era were incredibly interested in alternative forms of spirituality, particularly those that related back to nature, prefacing hippies. After all, science and spiritualism were seen to many people as one art. Chemistry came about as a byproduct of alchemy, astronomy with astrology. And for centuries, many astronomers took the existence of extraterrestrial life as an article of faith. It was one of the reasons they wanted to look. After leaving Aerojet, Parsons founded a chemical engineering company called Ad Astra that came under FBI investigation when it was heard that Ad Astra was making “x-metal” (uranium) from Manhattan Project insiders. 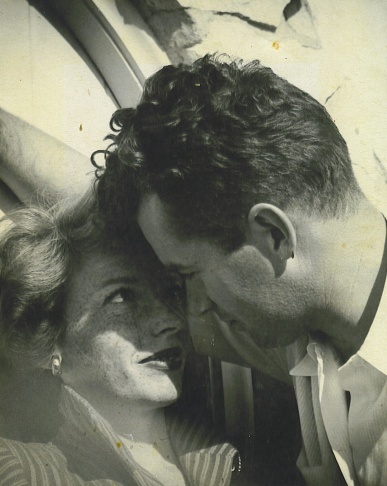 He and Marjorie Cameron moved to Manhattan Beach, and he worked at North American Aviation in Inglewood. Parsons’s occult activities and links to Marxism came under scrutiny at the start of the Cold War. He’d been a subscriber to communist newspaper People’s Daily World, although he’d never formally joined the Communist Party. He self-described as an “individualist,” but rumors about Thelema’s free love and devil worship caused him to be labeled as a degenerate and be barred from the industry. Parsons testified in court that OTO was “anti-fascist,” and as a result he briefly won employment at Howard Hughes’s aircraft facility, before a secretary accused Parsons of spying and he was blacklisted a second and final time. He moved back to Pasadena and held parties at a new, smaller house that were attended by occultists and artists from the burgeoning Beat Generation. He started working in special effects, and he died concocting stunt explosives in his Pasadena home at the age of 37. Jet Propulsion Laboratory maintains traces of Parsons’s strange legacy. The campus is built on a hillside in La Cañada Flintridge because of its proximity to the seasonal river channel Arroyo Seco, where Parsons and cohorts conducted their earliest rocket experiments. Parsons’s interest in Arroyo Seco was twofold. It was an isolated geological area where he could carry out his gonzo rocket testings. But it was also a draw for an occultist like Parsons because of a geological feature called Devil’s Gate — a large rock shaped like a devil’s head with a pointy horn. There was a folk rumor among locals that the mouth of the Arroyo Seco was also a portal to other dimensions. Parsons conducted ceremonies and rituals with his OTO followers at Devil’s Gate, in the same rocky channels where he also tested rockets with the proto-JPL. Parsons’s aims for rocket science and chaos magick were the same: to make the seemingly impossible plausible. And rocket science is a type of chaos magic. (Some fireworks, after all, are rockets.) To see a rocket go up is to feel a palpable sense of awe, to see the gap between human ambition and achievement closed, gravity defied. The Pasadena area is rife with haunted folklore. The high, narrow Colorado Street Bridge built in 1913 is known as Suicide Bridge, for obvious reasons. An abandoned house turned park at the base of the foothills is known as the Haunted Forest. Devil’s Gate was already a local paranormal hot spot for its devil’s-head rock and eerie gorge, but it gained further notoriety for a series of high-profile child disappearances on the surrounding hiking trails. Two children disappeared in 1956 while riding their bikes by the dam; in 1957, an 8-year-old disappeared during a family hike and was never found; and in 1960, a 6-year-old on a YMCA campout vanished. The 1956 disappearances were claimed by a serial killer named Mack Ray Edwards, who abducted and murdered the children. Edwards worked for Caltrans and buried the bodies on roads he knew were about to be paved over with asphalt to become freeways. I went to the Devil’s Gate area on a dark night and then again on a misty day after some much-needed L.A. rain. At night, the Devil’s Gate Dam, built in 1920, feels massive. While the walkway is lit with soft globes, when you peer down over the edge of the dam there is nothing but blackness and the sound of water lapping. It was too dim to see the devil’s-head rock, and I wasn’t sure exactly where to look. On the other side of the bridge, you could see the lights of JPL twinkling on the hillside. While there was plenty of light pollution emanating from nearby, you could still see some stars. My friend pointed to the milk-white constellation of Orion’s Belt. Molly LambertBy daylight, the dam was much smaller than I’d imagined it was at night, and its emptiness less imposing. I followed a tunnel that leads through the dam into the park, to a muddy trail and hills verdant from the morning rain. After taking a series of wrong ways, I found the steep staircase that leads toward the gorge. I was convinced it would be too flooded to get close, but it was merely wet. The staircase cuts off abruptly at a viewpoint by the devil’s-head rock. There was a terrifying ladder descending further down to the tunnel — both covered in graffiti — that supposedly goes all the way through the mountain. At the top of the ladder, someone had thoughtfully tagged “666” in white spray paint. You could see the devil’s-head rock from the top. It is truly impressive; it truly looks like a devil. I was too scared to climb down the slippery ladder death cage into the swampy water at the bottom, so I stayed crouched at the top of the ledge, picturing how I would handle the situation if my friends who had chosen to descend just never came back, Picnic at Hanging Rock–style. I did not feel any evil, but I did sense a strange, ancient energy — the vastness of nature and surreality of being inside the chapel of the wilderness while still being so close to Los Angeles, of being exactly where Parsons tested the limits of reality. There is a clear connection between the exhilarating vastness of nature and the massiveness of space. Space might be a desert, but even in the desert there is abundance. For space dreamers like Jack Parsons and Elon Musk, the universe could never be an airless void. It’s a sensual, orphic world of its own. And if Mars One is involved, the worst-case scenario is the whole world watching it on live television. Parsons credited the ritual with bringing him Marjorie Cameron, the artist who became his wife and muse.